The racecourse is the oldest in the country, and it’s where I spent the day with Lucy and Jade for their wedding! 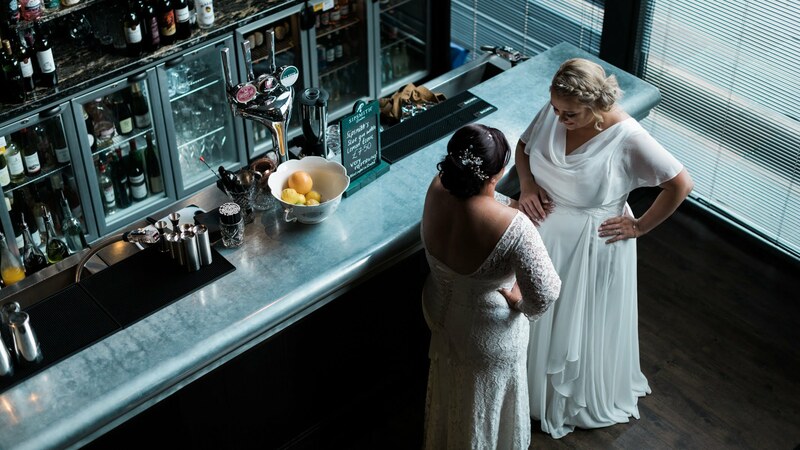 The Abode hotel where they were getting ready was great, the short walk to Chester Racecourse was a blessing. The lack of people at the racecourse made it feel like it was totally ours, loads of natural light in the ceremony room for the photography. The intimate amount of guests made the formals stress free, and the 1539 restaurant and bar where we’d spend the rest of the day was simply awesome; food and staff included! Clare and I met Lucy and Jade several years ago, whilst covering a wedding. Lucy approached us and nervously asked if we’d mind taking a picture of her and Jade. I guess things were pretty new for them both back then, and skipping forward 5 years, I never imagined I’d be standing at Chester Racecourse waiting for them to arrive in wedding dresses. To see them both say there vows, it was truly a lovely thing. Both girls were suitably emotional as they both stood at the alter, and everyone in the room could see how much this moment meant to them both. A reading, 2 x I Will, hugs, kisses, eye’s dabbed, signatures signed and quick sprint down a very short aisle! Over to the bar; Drinks, lounging, laughing and then off for the Wedding Breakfast. Emotional speeches by all. Glasses raised and loved ones remembered fondly. Bright sunlight and 2 white wedding dresses meant there was some fancy fiddling with my settings needed. We got there though, and we headed off to get some shots with Chester Racecourse in the background. We also sneaked in a couple of bump shots for them both, which meant no drinking for Lucy, but I think Jade had got that covered. LED balloons (which were great! ), 2 casino tables, and the sun lowering made the roof top bar a pleasure to be surrounded by, and everything felt just that bit more special. First dance shots nailed, I said my goodbyes and best wishes, and then headed for a very long drive home. Here are a few of our other weddings that are just a bit further than Yorkshire also, if it helps. Andrew and Vicki’s from Northumberland, and one of our favourites …. Emily and Craig’s awesome day in Northampton!